Author(s): Breanna L. Zerfas, Jianmin Gao. Boston College Department of Chemistry, 2609 Beacon St., Chestnut Hill, MA 02467, USA. With the continued rise in antibiotic-resistant bacteria, there is an immense need for the development of new therapeutic agents. Host-defense peptides (HDPs) offer a unique alternative to many of the current approved antibiotics. By targeting the host rather than the pathogen, HDPs offer several benefits over traditional small molecule drug treatments, such as a slower propensity towards resistance, broad-spectrum activity and lower risk of patients developing sepsis. However, natural peptide structures have many disadvantages as well, including susceptibility to proteolytic degradation, significant costs of synthesis and host toxicity. For this reason, much work has been done to examine peptidomimetic structures, in the hopes of finding a structure with all of the desired qualities of an antibiotic drug. Recently, this research has included synthetic constructs that mimic the behavior of HDPs but have no structural similarity to peptides. This review article focuses on the progression of this field of research, beginning with an analysis of a few prominent examples of natural HDPs and moving on to describe how the information learned by studying them have led to the current design platforms. Keywords: Antimicrobial, Host-defense peptide, Immunomodulation, Innate-defense regulator, Peptidomimetic, SMAMP. Affiliation:Boston College Department of Chemistry, 2609 Beacon St., Chestnut Hill, MA 02467, USA. Keywords:Antimicrobial, Host-defense peptide, Immunomodulation, Innate-defense regulator, Peptidomimetic, SMAMP. Abstract:With the continued rise in antibiotic-resistant bacteria, there is an immense need for the development of new therapeutic agents. 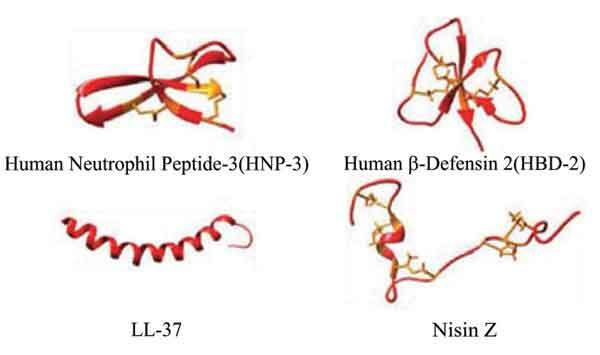 Host-defense peptides (HDPs) offer a unique alternative to many of the current approved antibiotics. By targeting the host rather than the pathogen, HDPs offer several benefits over traditional small molecule drug treatments, such as a slower propensity towards resistance, broad-spectrum activity and lower risk of patients developing sepsis. However, natural peptide structures have many disadvantages as well, including susceptibility to proteolytic degradation, significant costs of synthesis and host toxicity. For this reason, much work has been done to examine peptidomimetic structures, in the hopes of finding a structure with all of the desired qualities of an antibiotic drug. Recently, this research has included synthetic constructs that mimic the behavior of HDPs but have no structural similarity to peptides. This review article focuses on the progression of this field of research, beginning with an analysis of a few prominent examples of natural HDPs and moving on to describe how the information learned by studying them have led to the current design platforms.